Megan and Kyle attest to the fact that it really is a small world. They attended the same primary school and were effectively RE-introduced to one another by a mutual friend ten years later, having lost contact in the interim. After what Megan refers to as a clichéd first date of watching a movie and conversation over coffee, the couple found themselves to be an instant match. Kyle proposed to Megan nine years after they met while on a trip to Thailand, during a day trip to Ang Thong National Marine Park. After kayaking, Kyle unexpectedly proposed to Megan while they were snorkelling, during a moment she says she will never forget. The couple still have a good laugh at Kyle’s carrying the ring around in the pocket of his swim shorts while on their day trip, happy that it did not fall out and get lost. The couple regard themselves as a perfect fit, despite being opposites. While Kyle is more laid back and humorous Megan is a perfectionist and a stickler for detail, although both of them like to be extremely punctual. They are very supportive of one another in achieving their goals, and are one hundred percent committed to their relationship. Kyle builds up Megan’s confidence while she encourages him to attempt new challenges and to strive for greater heights. 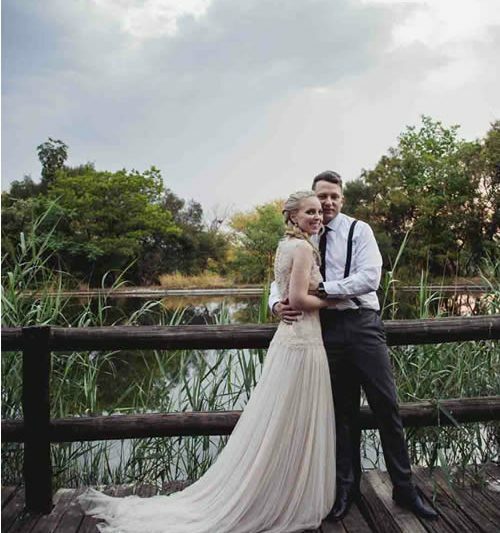 For their wedding venue Megan and Kyle chose The Indaba Hotel as it was closer to home; and despite being situated in an urban area once inside the venue you feel as though you are in the country. The lush gardens afford wonderful scenery for beautiful photographs as well as leaving the guests feeling relaxed in a tranquil environment. They also chose this venue for its many different packages and options. An in-house wedding planner and excellent staff assisted wherever needed with guidance in making decisions and planning. The venue also provides spa treatments for brides and grooms prior to the wedding if desired. The couple chose to have the small and intimate ceremony in the wedding chapel, as it had a quaint and romantic atmosphere to it. By nature Megan is rather reserved, so chose as her theme something classic and elegant, yet glamorous and beautiful. Wedding invitations were neutral and simple, and the décor fitted in with the theme she had envisioned. Many hours of planning resulted in what Megan regards as an absolutely delightful outcome. For décor, all white flowers (no roses) were used with bits of greenery, in combination with silverware and white. Candles and fairy lights helped soften the mood. 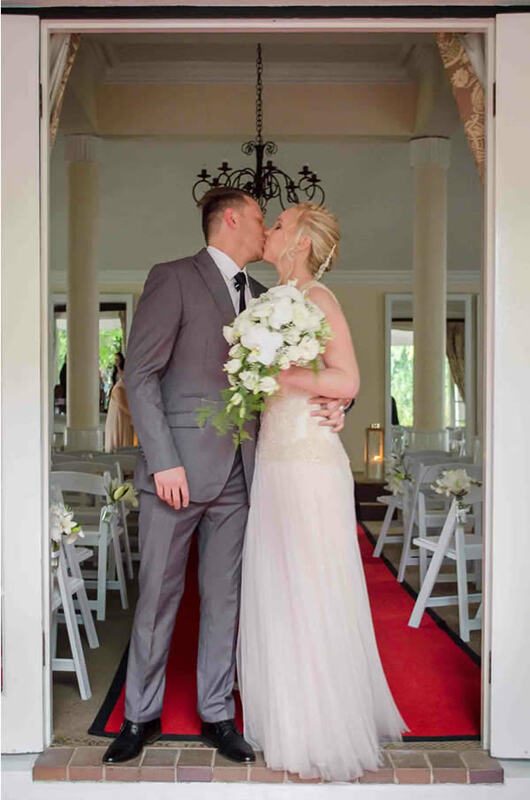 Megan chose a blush gown from the Modeca range of designs, imported from the Netherlands. Classic and elegant with lace and tulle with buttons down the back of the dress, she knew immediately that this was her dress. As she did not want to overpower the dress with jewellery, she chose a minimalistic look and wore simple silver earrings. Her long hair was styled in a side fish plait to complement the dress as well as her overall look, as the back of the dress was exposed. She chose a hair clip rather than a traditional veil, and makeup was soft to complement the look. Kyle later told Megan that when he saw her enter the chapel, he was so in awe that he could not stop shaking. Kyle and Megan’s day was made more special by three family members who are musicians who played the music while Megan walked down the aisle, while the minister is a family friend that has known Megan since birth. 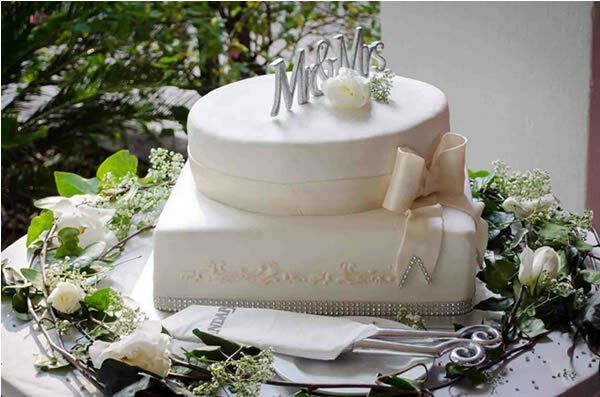 The cake was cut directly after the ceremony and served to guests while the photographs were taken. For the reception the food menu was extensive and delicious, and caused a number of guests to comment. 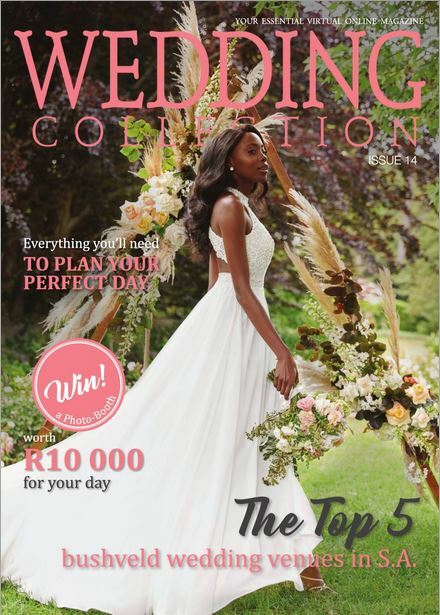 Megan describes their wedding day as “awesome”, and says that the one hitch was that the driver of the wedding car provided by the venue to collect the bride and bridesmaids arrived two hours late as he got lost. Megan was very happy that her “fabulous groom-to-be” waited despite the delay. 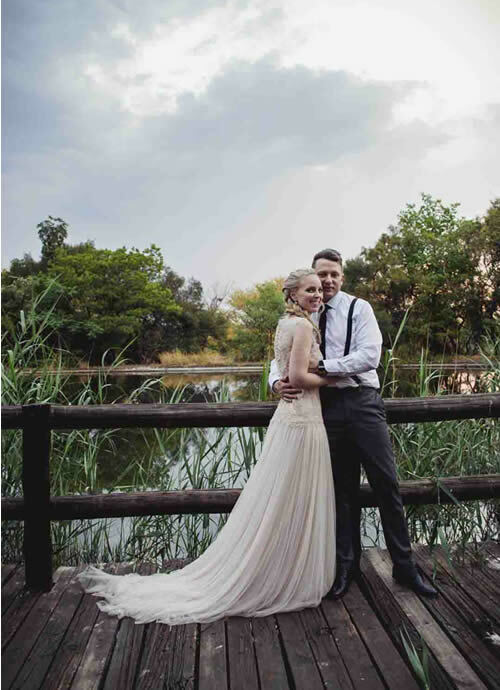 The couple were accommodated in a honeymoon suite which they say was absolutely amazing, and a number of guests took advantage of the accommodation available and stayed over. They all enjoyed a champagne breakfast in the morning, and say that they would highly recommend The Indaba Hotel as a venue. Getting dressed at the venue with my bridesmaids. Using the chapel and walking down the aisle. The gardens where the photographs were taken. Cutting the cake outside the chapel. The first dance which was hilarious as my husband has two left feet but after some practicing he owned the dance floor. Draw up a budget and stick to it as much as possible. Plan early as time goes by quickly. This special day only comes around once, so put your ideas and yourself first!